Futbol fever has taken over my household and the gorgeous images of the World Cup host country Brazil have ignited our imaginations. To complement our viewing of the beautiful games, I’ve developed this spicy shrimp dish based on the Brazilian recipe for coconut shrimp. They call it Moqueca and it’s a delicious stew of onion, garlic, green bell pepper, tomatoes, coconut milk, and of course, shrimp. The dish is traditionally made with palm oil (called dende in Brazil). That’s not the easiest thing to find around my parts so I’ve left it out of my version. I have, however, added in red amaranth from my CSA. Not to worry if you don’t have red amaranth on hand, baby spinach provides a fine substitution. Go on ahead and cook up this summer stew, steam some rice on which to serve it, open a frosty cold beer, and kick back and enjoy the games. Go USA! First, marinate the shrimp. In a medium bowl, place the shrimp, garlic, lemon juice, paprika, cayenne, and 1/2 teaspoon salt and toss to coat. Cover and refrigerate while you prepare the rest of the ingredients. Meanwhile, in a large deep saucepan, heat the oil over medium-low heat. Add the onion and pepper and cook for 8 to 10 minutes, until softened. Add the diced tomatoes and green chile and simmer for about 5 minutes, until slightly reduced. Add the shrimp with marinade into the pot and stir to coat with the sauce. Cook, covered, about 3 minutes, until the shrimp is just pink all over. Uncover and stir in the coconut milk and amaranth. Cook until the amaranth is wilted, about 1 minute. Remove from the heat and stir in the cilantro. Season to taste with black pepper and more salt, if you like. Serve over rice. *I used the Rotel brand of diced tomatoes and chilies. You can, however, switch out Rotel and use diced tomatoes instead. If you do, use only about 3/4 of the can since diced tomatoes generally come in larger sized cans. This substitution will also cut down on the heat of the dish. I’m not kidding, it’s pretty spicy. 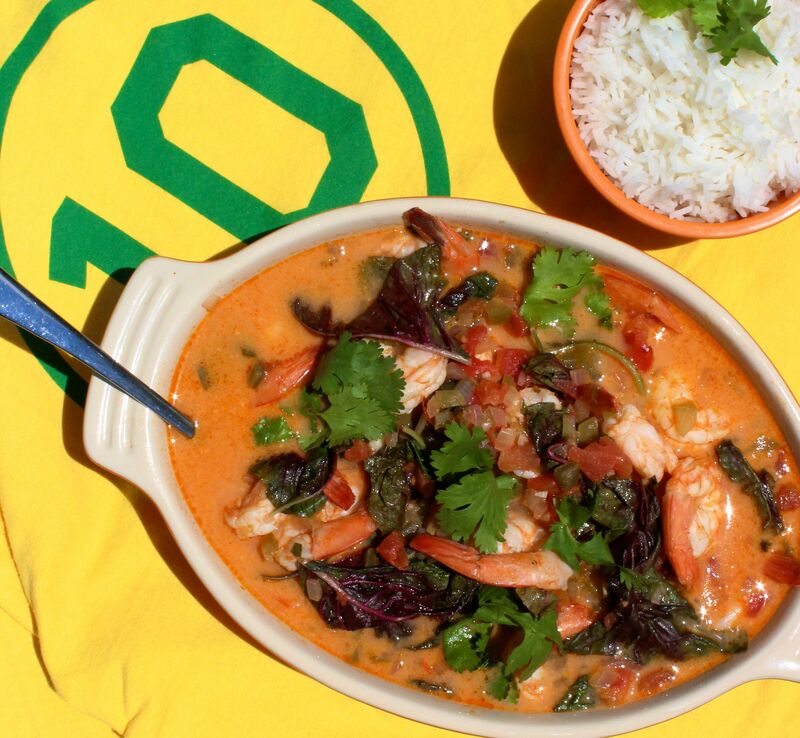 This entry was posted in main and tagged Brazilian, coconut milk, seafood stew, shrimp, stew. Bookmark the permalink.